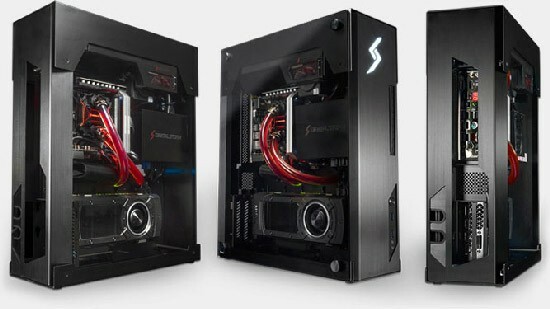 We have seen all sorts of cool looking gaming rigs but the latest edition from Digital Storm in the form of Bolt 3 is something entirely different. As you can see from the image above, it has a full glass panel so that everything inside is always visible. However, like other high profile gaming PCs, the Bolt 3 also does not come cheap and with the basic set of hardware it has a starting price of $1,547 only. The basic config will get you Intel Core i5 4950 CPU along with 8GB 1600MHz RAM. It will have Nvidia GTX 960 with 2GB of video memory. The 120GB Samsung 850 EVO SSD and 1TB HDD fill up the storage for this rig. The operating system of choice is of course Microsoft Windows 8.1. If the user wants to crank up the hardware, the most they need to fork out is $3,569 which will get them Nvidia GTX Titan X with 12GB video memory and Intel Core i7 4790K processor.